Beachfront House, 2 Bedrooms + Convertible Beds, 2 Baths. Sleeps 6. Want a house on a sandy beach? This two bedroom two bath beachfront house is located in Makaha, about 29 miles from the airport and 40 miles from Honolulu/Waikiki. The weather in general in Makaha is the sunniest and driest on the island. At your home away from home you can watch turtles frolic in the surf line, watch the whales swim by from your window, take a romantic walk on the beach at sunset and fish and swim on your own sandy beach. Our beach house is in a private sheltered cove and one of only three houses with direct access to the beach on that side of the street. We are just a few minutes away from some of the most outstanding golf courses on Oahu. The water park is just a short drive away. Want to attend a luau? No problem, Paradise Cove is just a few minutes away by car. At our beach house you will have the option to experience Hawaii as it was 'back then' without the hustle and bustle of the city or experience both the city life and your very own Hawaiian retreat. Unique Benefits of this House: The construction of this house allows you to have ocean as well as mountain views from every room. Even though it is a one level house, it is raised so that you can have an even better view of the majestic ocean below it. The kitchen has granite counter tops, beautiful wooden cabinets and new appliances. The house has been renovated inside and out. As you sit on your living room sofa, you might see a whale swim by because there is nothing between you and the ocean except the sandy white beach. Want a BBQ? You can fish for your dinner, walk a few steps and throw it on the BBQ grill in your patio or you could grill it on the beach while you watch the sunset. There are also two world class golf courses a few minutes drive away and one about 10 minutes away.The water park is also very near. Want to attend a luau? You will find one just a few minutes drive from where you are. Mr. & Mrs. Aloha: This gated house is wonderful because we have an on site manager who considers it a privilege to host guest from all over the world. Herman and Julie are called Mr. and Mrs. Aloha because they love their job so much. They can answer all your questions and give you a wealth of information about the area. 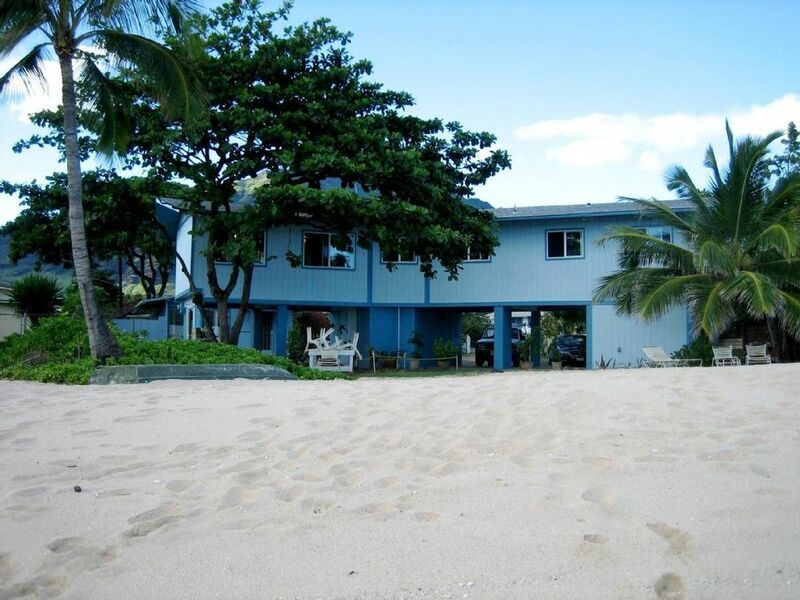 Our beach house is located on the west side of the island where it is sunnier and drier than any other place on Oahu. In fact, when it is raining on other places on the island, you will still be having the sun shine down on you. Because the sun sets on the west side of the island your days will be longer and sunnier which means you will be lounging on the beach longer & soaking up that sunshine so when you return home it will be with a beautiful tan. If you would like to stay at a retreat like beach house that is very private and peaceful, come to our beach house. Why Our Beach House? : Our family inherited this property from our Aunt whose husband was a contractor and built this house many years ago. Because it is on the west coast of Oahu and one of the most beautiful places on the island, we decided to turn it into a vacation rental so that other people could enjoy the natural beauty of this unspoiled paradise as much as we do. We have renovated the house so that all our wonderful guests can experience the natural beauty of this island as well as the comfort of a retreat like home. Our house is located in a private cove where there are only two other houses with direct access to the beach on that side of the street. For that reason you will find very little local traffic, if any, on your own private beach. The house is also by a natural reef so that when you are snorkeling, you might get to see the local marine life up close. If you have any question please do not hesitate to contact me through this website. I will be happy to answer them anytime and would LOVE to have you stay with us. Our family inherited this property from our Aunt whose husband was a contractor and built this house many years ago. Because it is on the west coast of Oahu and one of the most beautiful places on the island, we decided to turn it into a vacation rental so that other people could enjoy the natural beauty of this unspoiled paradise as much as we do. Although this house was built many years ago, we have totally renovated it so that our wonderful guest will have the benefit of the natural beauty of the land as well as the comfort of a retreat like home. Our beach house is located in a private cove where there are only two other houses with direct access to the beach on that side of the street. For that reason you will find very little local traffic, if any, on your own private beach. The house is also by a natural reef so that when you are snorkeling, you might get to see the local marine life up close. It is located on the west side of the island where it is sunnier and drier than any other place on Oahu. In fact, when it is raining on other places of the island, you will still be having the sun shine down upon you. Because the sun sets on the west side of the island, your days will be longer and sunnier which means you will be lounging on the beach longer soaking up that sunshine so that when you return home it will be with a beautiful tan. This beach house is right on a sandy beach. In fact the beach is your back yard. The house is right on a white sandy beach, one of only 3 houses with access to the beach. It is quite private and beautiful. During whale season, you can watch the whales right from your living room window. Every room in the house has an ocean view. We are a beachfront with ocean property, so you will have lots of white sand to lay on to get your tan 24/7 all year round. Contact me for additional information and pictures. This house also has a mountain view. The way this house was constructed, you will have an option between ocean or mountain view. We are an ocean front as well as beach front property. All bedding and bathroom and kitchen towels provided. Right under your beach house. This house is a direct beachfront and an oceanfront property so you will be able to lay on a white sandy beach 24/7 to get a suntan all year round. Beach is white sand and very private. Almost no local traffic. We are located 10 miles from the New Disney Resort, Aulani and the KoOlina Resort where you can go to if you choose to experience fine dining close to your beach house. We are 20 miles away from the Waikele Premium Outlets if you'd like to do a shopping marathon. And we are 15 miles away from Kapolei (the second city) where there are theaters, stores (Home Depot, Costco, K Mart, Target, and lots of local mom and pop shops) and tons of restaurants for dining (fast food places and lots of local family style dining). This is a great little place that although is off the main road, once you arrive it is very quiet and you are right in the beach. The caretakers, Herman and Julie couldn’t have been more welcoming and accommodating. Herman spent time teaching our son how to fish and he even caught some! Then we enjoyed the catch the next evening courtesy of Herman’s grilling. Herman was so kind and patient and is a wealth of information on the ocean which was fascinating to a future marine biologist! Julie is a lovely person who is so welcoming and kind. Being able to truly relax was possible because the beach is right there and very quiet - we were the only ones there! The beach is great for snorkeling but not so much for swimming because of the rocks- but a short walk down the beach and you can enter to swim. We even have the pleasure of meeting “Benny” the sea lion who visits and sunbathes there. The house has everything you need and if something is not there I am sure Julie would find it for you! The view and ocean location was amazing. Whales, dolphins and seals off the shore. Our hosts were great. . .flexible, hospitable and wonderful. Snorkeling right off back yard. Ocean and sand 10 feet from the house. Thank you so much for coming to visit us. We are so blessed to have wonderful visitors like you. Please come back to visit us again. Mahalo and Aloha. I loved my stay at this lovely peaceful ocean front home. It’s a perfect place to relax, recharge and enjoy. The location couldn’t be any better especially with the serene ocean water as your backyard with breathtaking sunsets. Very clean and comfortable with a full kitchen, living room, TV and comfy beds. If you’re looking for a vacation in a peaceful quiet lovely location, this is it. Going to sleep to the sound of the waves every night was so rejuvenating. A big thank you to the caretakers, Julie and Herman who were extremely welcoming, helpful and knowledgeable of places to go on the island. I wouldn’t hesitate to recommend this lovely rental home and I would stay here again. This property was fabulous!!! We enjoyed it very much!! This is a beautiful property. We enjoyed our stay very much!!! I would totally recommend this property!!! Thank you so much Nicole. We are so blessed to have lovely visitors like you. Please come back anytime. We loved having you visit us. We stayed the week of Thanksgiving and it was fabulous. My daughter (6) fell in love with Julie and Herman! They were absolutely fabulous and sent goodies over! The view is amazing and will forever be special to me as I was proposed to in the backyard on the sand! We will definitely be back! At first I was worried about not having A/C but it wasn’t a problem at all. We are from Texas so A/C is a most BUT was not needed! We had the windows open and fans. The kitchen was well stocked with dishes and even some condiments! Love everything about this home. Awwww Congrats! We are absolutely thrilled that you enjoyed your stay. Every one of our visitors are special to us but getting proposed to in the back yard is AWESOME! Thank you for letting us be a part of this wonderful event. Love to you and your family. Come back anytime. Thank you soooooo much Hilary. We LOVED having you stay with us. Please come back anytime to visit us and consider this your home away from home. We are a beach front with ocean property, so you will have lots of sand to lay on to get your beautiful tan 24/7 all year round. White sandy beach is just 10 steps away from your door. Golf: There are three world class golf courses very near to our beach house. The Ko Olina golf course is Oahu's premier Ocean View Championship Golf Course designed by Ted Robinson. It is an 18 Hole Championship Golf Course which provides exceptional water features, multi tiered greens, expansive landing areas, no parallel fairways and measures up to 6,867 yards from the back tees. It is a 10 minute drive from our house. The Makaha Resort Golf Course is about 2 minutes away by car. This golf course was designed by William F. Bell to accent the stunning natural landscape of Makaha Valley. This championship course was acclaimed for its beauty as much as its rigor by Golf Digest, and was named the Island's best course by Honolulu Magazine. This classic 18 hole, 7,077 yard, par 72 course calls for a variety of shots and just about every club in your bag. With a USGA rating of 73.2 it challenges professionals and amateurs alike. Those with a sense of history will delight knowing that Hawaii's royalty used Makaha Valley for their recreation. The peacocks seen and heard throughout the valley were a gift from King Kalaukaua to the owner of the historic Makaha Valley Ranch more than 100 years ago.